Blurb: No Meat Athlete is the plant-based guide you need to perform at your very best, from starting block to finish line. No Meat Athlete combines proven training plans, easy yet innovative recipes, and motivational stories into a unique fitness guide, healthy-living cookbook, and nutrition primer. The guide is perfect for all athletes, from beginner to elite, who want to enjoy the health benefits of a meatless lifestyle. Veganism, already a top food trend and diet, is taking off in the sports world. The lifestyle has been adopted by Olympians, body builders, and boxers, as well as top athletes in the NBA and NFL. Hollywood is on board, too. James Cameron (director of Avatar and Titanic) has produced a film on the topic called The Gamechangers, which follows vegan athletes, including Arnold Schwarzenegger, U.S. Olympian Kendrick James Farris, and surfer Tia Blanco. In this revised and updated edition, you’ll also find new recipes, advice, and additional training plans. Section I of the book provides practical advice for transitioning to a plant-based lifestyle, while ensuring you are getting all the nutrition you need. Here you’ll also find recipes to maximize performance, endurance, and recovery. In Section II, Matt delivers training manuals of his own design for runners of all ability levels and ambitions, including tips for creating healthy habits, improving performance, and avoiding injuries. No Meat Athlete is your road map to top-notch performance, the plant-based way! 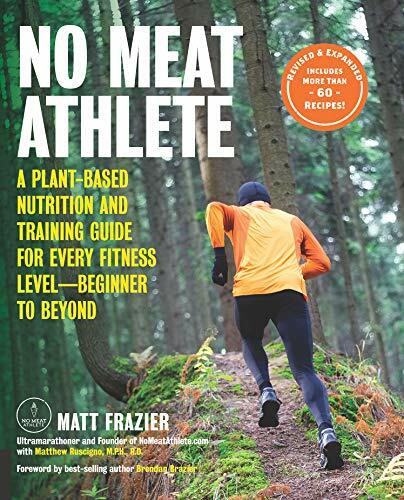 Matt Frazier’s No Meat Athlete is a good resource for either athletes considering becoming vegan or vegans wanting to become more active, especially if they want to become runners. Frazier offers good advice at the beginning, especially in two forms: start (which might seem obvious, but he explains that a lot of people get too hung up on the plan, but never actually start), and make it a habit. I confess that I became a vegetarian overnight without a plan around 10 years ago. I’m still trying to make that plan and make sure I eat healthily. The other thing he advocates is eating whole foods, which can be easily forgotten in this world of convenient foods. As we have probably learned, convenient foods are not the healthiest. Most of the recipes are fresh and welcome takes on old favorites. There are the ubiquitous smoothies, which I will never ever make because they are caloric and never filling (my personal bias, which has been stated on this blog more than once). I’m sure someone can argue otherwise. Included in the recipes are several bean and rice recipes, which look enticing, and as Frazier says, they encompass the full range of amino acids. After the recipes, Frazier has sections on how to become a runner, including instructions on proper running technique, and a guide to strength training as well as a section on how to form and achieve your goals. For the beginner, I think this is a well-written and thought-out guide to becoming both vegan and athletic, with the focus on running. I think a nice addition would have been a few menu plans as a guide for beginning vegans who are changing their way of eating so that they could visualize what a healthful daily menu would look like. All in all, this is a good resource. Arnold is a vegan? That’s a shock. But I’m glad these kind of books are inching their way into the public’s eye thanks to reviewers like you. Yippee! Widening the horizons. Thanks, Maggie. I was a vegan marathoner for many years. The trouble was, I was gaining weight and feeling very sick. I ate other sources of protein, I juiced my lunches – but I gained weight. I started eating meat again (I had only dropped meat for the health benefits) and lost the weight and started reaching my previous racing times. I still don’t eat gluten or dairy (allergies) but adding meat back in was really beneficial for me. I just thought if I became a vegan I would lose a lot of weight and run faster – for me the opposite was true. I do believe that our genes must come into play. I had a lot of health benefits from not eating meat as 11 years ago I was prediabetic and after becoming vegetarian (I am not vegan) my numbers dropped. But I do believe his claim of eating whole foods. The new Beyond Meat burger had more calories than a regular burger. If a person eats that and thinks it’s healthy, they will be unhappy with the net result. Totally – I feel the best when I eat whole foods. Meat or no meat. I think that food can heal us – just eat the right stuff!